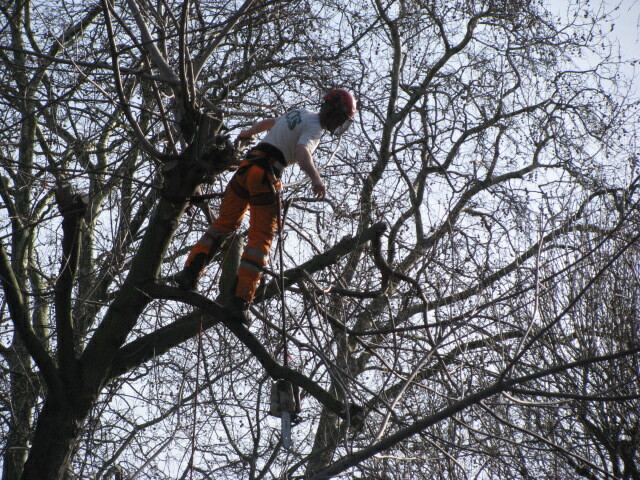 The tree doctor that is. So far in my neighborhood I have seen creative parking by a Smart car and I’ve learned how to parallel park a horse. 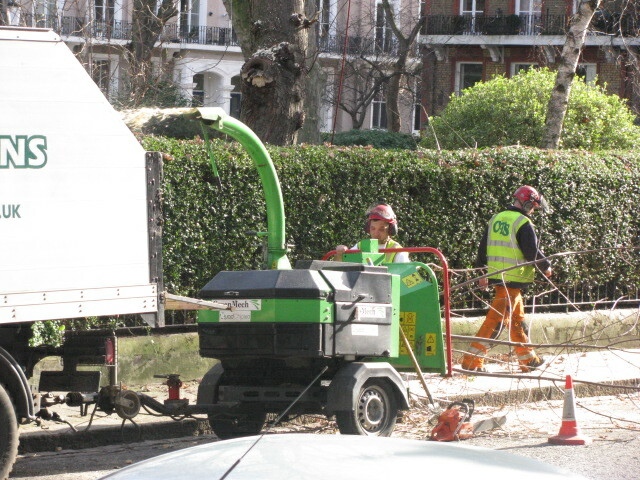 Now I know that when the tree surgeon is in town, you can’t park your car. The doctor at work. I warn you, the images are disturbing. His assistants help with the carnage. This patient didn’t make it. 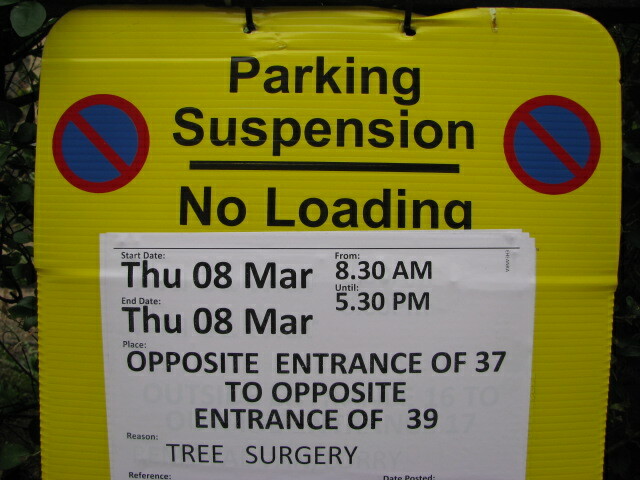 This entry was posted in London, Random and tagged City Issues, City Parking, England, Horse Parking, London, Parking, Smart Car, Tree Surgeons, Tree Surgery. Bookmark the permalink. I’m here to help! I’m not much of a morning person so I know it can be rough. 🙂 I do hope the diagnosis was correct and that the patient had no chance of survival anyway? Enjoy your weekend! 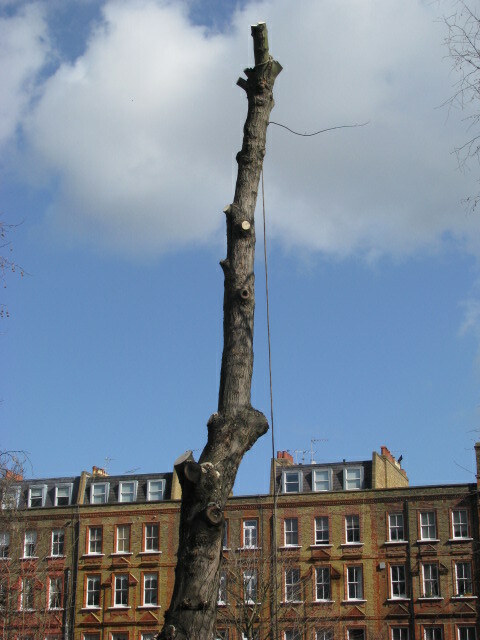 It was the only one they chopped down completely so I hope so. Have a wonderful weekend! poor tree.. it must have been so noisy outside! Maybe that was why this apartment was available. At least they are fixing up the place. It will look nice when it’s done. And the guys are so nice and make me laugh each day. One of the trees behind my house had the same destiny. Not sure why they dod it. It looked okay to me. It’s always sad to see them go. I was surprised to see this one go as well since it seemed healthy. Hopefully I was wrong and they were right. Very disturbing indeed. Was the tree actually dead? Our neighborhood is filled with big trees that have been trimmed to death because of power lines. I didn’t notice anything unusual about the tree. I know they looked at the trees the week before and trimmed most of them. They came back to remove this one completely. Thanks Nia. My weekend was a lot of fun. I hope yours was enjoyable. Fun post, thanks for sharing. When I am in a restaurant choking and they ask, “is there a doctor in the house?”, I hope he doesn’t show up with his chainsaw! This neighborhood has kept me amused. I’m glad I could help. I wish you well Novroz. I hope so…it was such a beautiful tree. Somehow I was reminded of Dr. Seuss’ The Lorax: “I speak for the trees, for the trees have no tongue” – thank you for giving voice to this tree, dearest TBM. We had a lovely, enormous tulip tree in our yard for the first 10 years we lived in our home. Unfortunately it was struck by lightning and for years the base was being eaten away by bugs. On top of that it leaned towards our neighbor’s small home, lived in by an equally small elderly lady. If it fell, it would land right on her bedroom. I eventually decided to stop tempting fate and had it taken down. It was like watching artists at work. They were amazing. 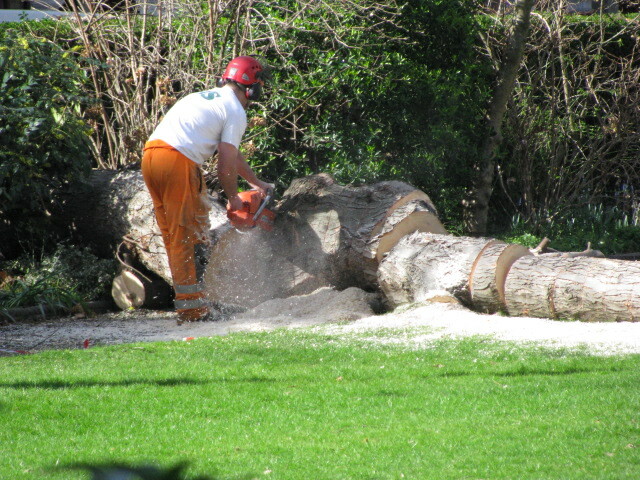 It was very, very sad to see the tree go, but I am glad I got to witness the process of its passing. It is a sad thing to watch, but yes they are like artists. I cringed while I watched this poor guy in the tree taking care of this tree. 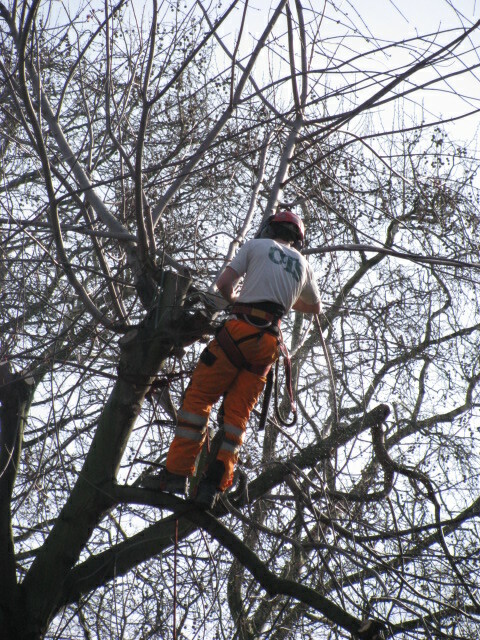 I’m sorry to hear about your tulip tree, but it is better to be safe than sorry. The alternative is too horrible to even think about.